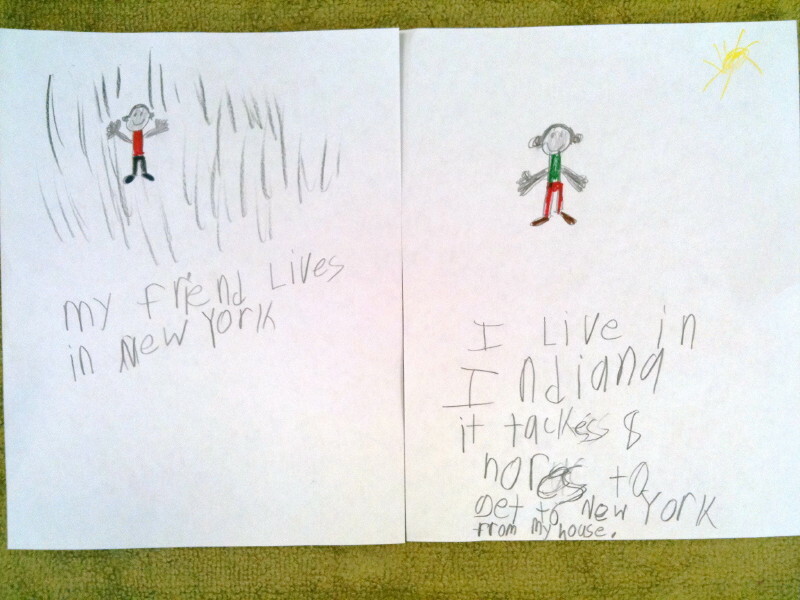 A 2nd grader's spread from a book about his visit to NYC. Hmmmm, not quite what I expected. Instead of pushing him to add more, I invited him to ask the other writers in the class for help during the share session. At the end of writing workshop, I invited students to bring to the circle anything they would like to share with others. In this kind of share, students bring pieces of writing advice, things they’ve learned about writing, or questions to help them write better. The above spread ended up being a topic of conversation. “Can you draw a car?” one boy asked. It started a slew of ideas from other students: the Statue of Liberty, tall buildings, lots of people, a fancy hotel. Then K. asked them for ideas about the Indiana page. Again the ideas piled up: a farm with a barn, cows, corn,corn,corn, tractors. Watching these young writers work together reminded me one of the purposes of a share session is to build a community of writers within the classroom. Community ties strengthen when we help one another. I’m planning on encouraging this use of the end of workshop share more often. How about you? How do the writers in your classroom help each other? Thanks for giving an example of how to build community among young writers. They do have lots of energy. I am assuming that K. welcomed the possible revisions from his peers more than if you would have continued to pursue the idea during the conference. 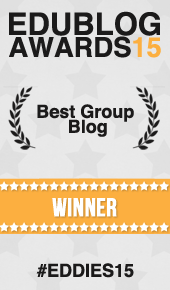 It’s a reminder to me how powerful the community can uplift the writing. As the teacher, I’m more of a facilitator at this point. This is such a great illustration (ha–illustration!) of how sharing can be much more powerful than a show-and-tell session. I think that we often forget that if we teach children a purpose for sharing and how to do it, there are rich opportunities for learning and for mutual support among writers. Even very young writers can learn to do this, providing them with a reason to think about and use what has been taught in workshop. Wow! Love this post! I’ve always found sharing to be the most powerful instructional time within writer’s workshop. I love how you brought in the collaborative aspect of authorship. I’m just learning more about the theorist Bakhtin and how all language, including writing, is mediated by our past experiences, those around us, institutional forces, etc. This fits with that perfectly! K. was ready for his book to be DONE! He ran out of steam and was rushing to get to the end. This is typical of young writers, you know, how they have lots of energy at the beginning of a book & not much at the end. That’s why I asked him if he wanted to bring it to the share session, so it wouldn’t be a battle between us. In the end, it doesn’t really matter if he adds more setting details. What does matter is he determines he is finished with a book because the book is complete, not because he has ran out of energy for writing on a particular day. Do you think K. wanted to lead the class into helping him? Could he have done that with a purpose? It is almost like he was mimicking the teacher here in not providing details that you normally would expect of him, so he could start a writing conversation. Probably not, but an interesting thought. Very nice discussion amongst these young students!